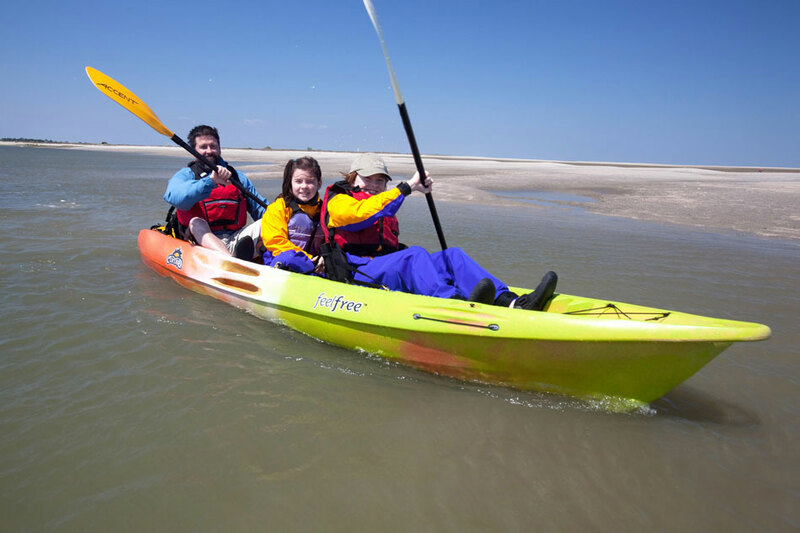 A versitile 2 or 3 person family sit on top kayak offfering brillaint stabilty, perfect for days of family fun on inland waterways and clam costal waters. Note: Seats & Drinks bottles are an optional extras. The problem with most tandem sit on top kayaks is that they are great for 2 adults, but as soon as you try and fit a third small person in the middle, you run out of room very quickly and the whole thing becomes rather uncomfortable. Solving this issue is where the Feelfree Corona really excels. The Corona is a superb family sit on top with 3 fully dedicated moulded-in seat positions and footrests. Only slightly longer than the Feelfree Gemini Sport but far more practical if you need the room, the Corona is really stable and easy to paddle – especially when the whole family gets involved. Used as a platform for summer fun at the beach, the kids can jump on and off the Corona as it has excellent stability and bags of room. Take the Corona for a trip along the coast and you’ll really start to appreciate just how well the boat tracks and glides through the water. With a carrying capacity of around 280 kg’s (that’s 44 stone), a built-in wheel in the keel for easy getting to and from the water, moulded-in carry handles and a very flat top deck that’s easy to strap down to a car roof rack, the Feelfree Corona really ticks all the right boxes as a companion for family adventures. The Corona is available in a range of colours and will take any Feelfree sit on top kayak seat (Sold Seperatly) for added comfort when spending a day on the water. The Feelfree Corona ticks all the boxes for having days of fun with the family, so what are you wating for grab a Corona and get the family on the water. Length 13' 2" / 403cm. Load Capacity 617lbs / 280kg.